Here at Pro Football Focus, we keep track of everything that happens on a football field. Every player on every play of every game. Thanks to that, we’ve got a tremendous database just loaded with football goodness. We’re going to dive into that database and look at which receivers were the most productive last season on individual routes. The metric we’re using to rank these players is wide receiver rating. Simply: WR rating is the passer rating that a quarterback earns when throwing to that receiver. Some context here, these are the numbers each receiver saw on the basic routes of our route tree definitions. At PFF, we have multiple modifiers for routes that are broken off, combination routes and specialized routes by design like a ‘back-shoulder go.’ The numbers below are just based off the basic design and execution of each route, not inclusive of combination routes, specialized routes or modifiers. 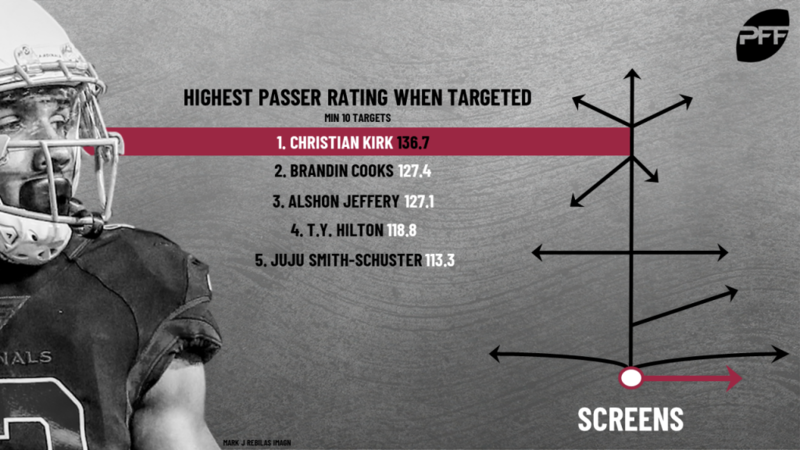 Kirk led all receivers with at least 10 targets on wide receiver screens last season in terms of wide receiver rating. Kirk caught 9-of-11 targets on screens for a total of 105 yards and a combined four first downs and touchdowns. Kirk was one of seven receivers last season to be targeted at least 10 times on screens and average at least 4.0 yards per route run (4.04). Higbee caught all 10 of his targets on quick outs this past season, accumulating 89 yards (with 69 of them coming after the catch) to go with four first downs and two touchdowns. Cooper caught 13-of-16 targets on slant routes in 2018, turning eight of those catches into first downs while also scoring a league-leading four touchdowns on the route. 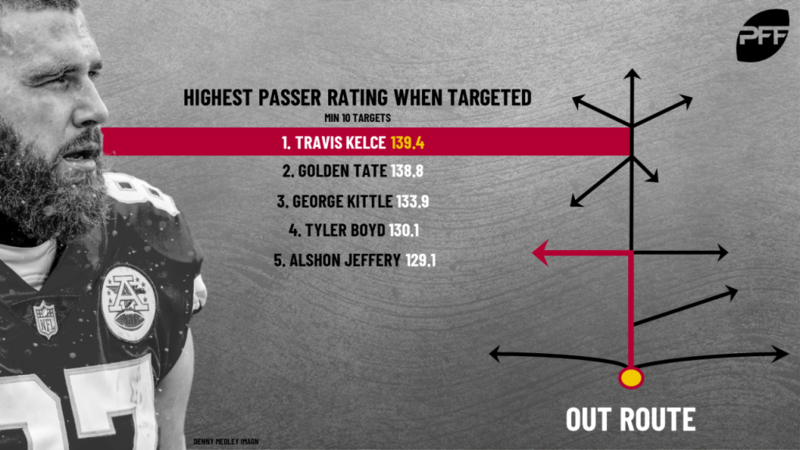 Kelce hauled in 12-of-15 targets on out routes in 2018 for 182 yards, seven first downs, and a touchdown. His average of 4.92 yards per route run on the route was fourth-highest mark among 59 offensive players who ran at least 10 out routes. Thomas caught all 13 of his targets on in routes last season for 210 yards (second-most in the league on in routes), eight first downs and a touchdown. Thomas led the league with four contested catches on in routes, and his average of 9.13 yards per route run was nearly two yards greater than anybody else in the league. Thielen caught all five of his targets on comeback routes this past season, picking up a first down on all five plays. There were just four offensive players in 2018 who were targeted at least five times on comeback routes, as there were just 151 total throws attempted on comebacks. 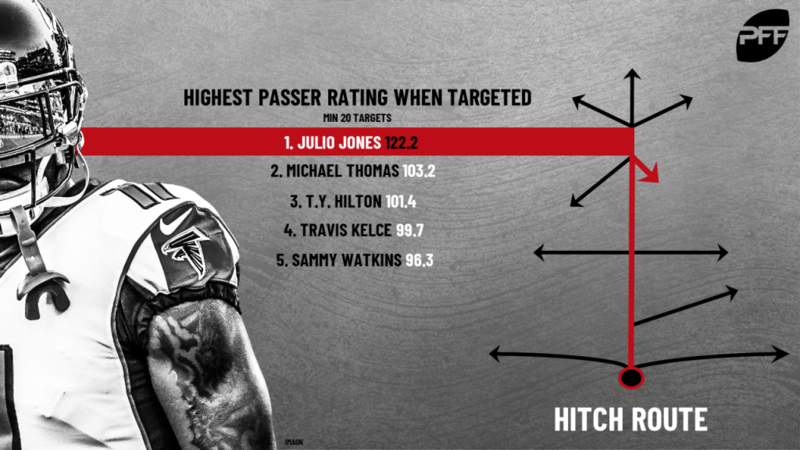 Jones hauled in 19-of-22 targets on hitch routes in 2018 for a total of 213 yards. He ranked second among all offensive players with 14 combined first downs or touchdowns on the route, and he was one of just three receivers to average at least 3.5 yards per route run on hitches. Hooper caught all seven of his targets on corner routes in 2018, accumulating 159 yards and picking up either a first down or touchdown on all seven plays. His average of 13.25 yards per route run on corner routes led all offensive players. Nelson caught eight of his nine targets on post routes in 2018 to go with 154 yards, a touchdown, and seven first downs. The veteran receiver was one of just seven qualifying offensive players to earn an elite receiving grade on the route, leading the group at 96.3. 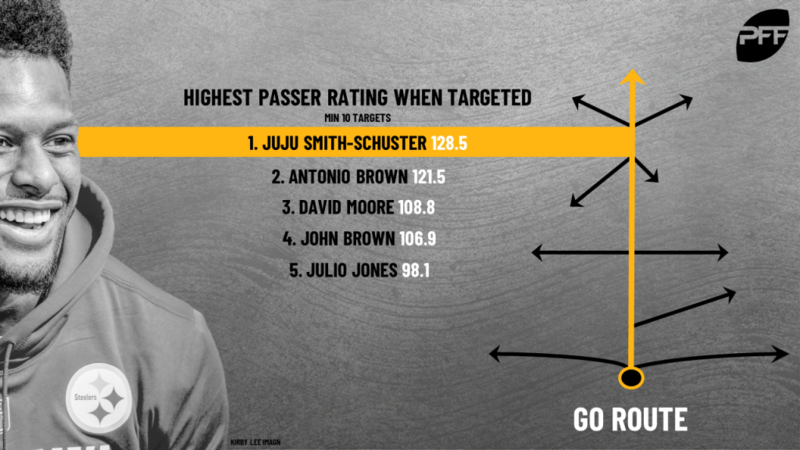 Smith-Schuster caught 5-of-12 targets on go routes this past season for 247 yards and two touchdowns. A 41.7 completion percentage might seem low, but it was the second-highest completion percentage any qualifying receiver earned on the route in 2018. Hopkins caught 12-of-16 targets on crossing routes in 2018 for a total of 300 yards, three touchdowns, and seven first downs. Hopkins wasn’t just running shallow crossers either, his 20.2 average depth of target on the route ranked second among qualifying receivers, and his 25.0 yards per reception on the route led the group.